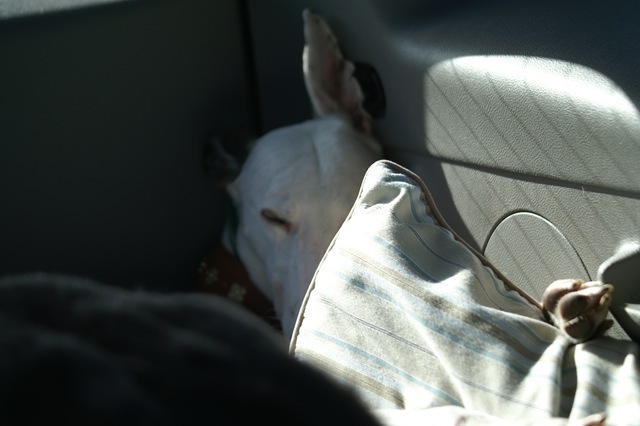 Renner Sleeps In Back Of Car. on the ones that went in, but we have to wait for the lab tests to come back, then see if there is anything we need to do from there. Then the Fridge in our camper was recalled, we just had the camper in last week getting a winter thing done on it, and the stairs fixed (they quit working right the end of last fall) last week, would have been nice to get the recall letter BEFORE we did that, but no it came right after we got it home from the shop. So took it back again yesterday. Hopefully they can fix it up in good time so we can go visit my Mom and Dad with the doggies when the time comes. I also had to hunt some new kitty food for Monty. He and Vinni are the old guys of the crew here, will be 20 in April, and Monty is supposed to be eating NF, but can’t tolerate it for some reason. So I started giving him regular kibble again. That helped a lot, but was too high in protein. So I was trying to find a commercial brand that matched the vet kibble, that he would be able to eat. I came up with a few choices, but couldn’t find any of the brands at my normal haunts. So I got a kibble that was close for now, however…he snubs it. I guess less protein means less appeal, which makes sense. 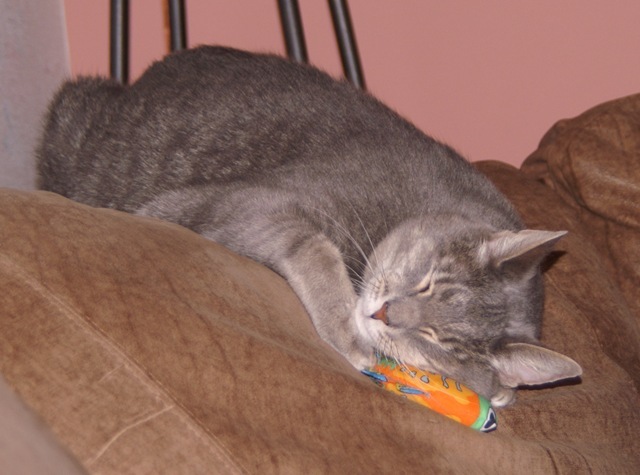 Sigh – well….what do you do then…something I have faced with many a pet. We usually just work until we find some sort of mid-ground that works for all, it is just finding it that can be tough some times. After finding the kitty food we moved on to Fresh and Natural. F & N or a Whole Foods. I like the organic stores better anyway, but they are pretty expensive. After going back home to feed the dogs and let them out, (where we’d be in and out a few times already) we stopped for dinner. When dinner was finished we went to the airport to pick up the kids who were coming back from San Diego. 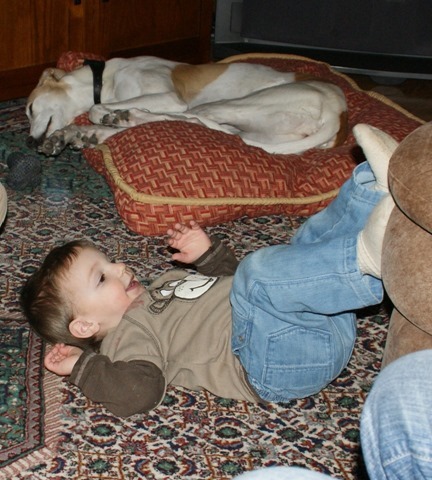 Brought them back to their house, then came back to our house to pick up Ruby, my GrandGreyhound, to take her back home. Everyone was very glad to see each other. 🙂 Blew had graced us twice that day with a peed on floor…frustrating, but he is an old man and had a rough day (does not like going to the vet), so we felt pretty bad for him. Having such a tough day then having your owners gone off and on so much is not easy for an old guy. By the time we got home and settled in again it was about bed time. Being busy is good of course, but sometimes I feel like I should just have a revolving door installed at my house. 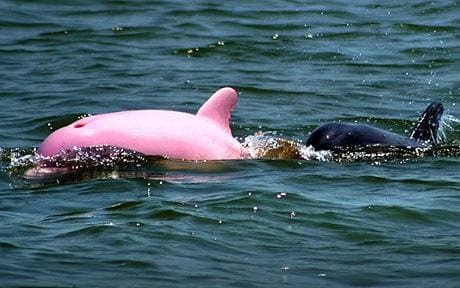 Pinky is the world’s only Pink Bottlenose dolphin and was discovered in a Louisiana Lake. It’s coloration is due to albinism. And just when you think you’ve seen everything to see that is possible in pink, one more thing pops out at you. Truly fascinating. Yes, Grandson + MeeMa = Loud around our house. After chasing Bampa with a snake around the kitchen island for a while, then chasing Meema around the house with a snake, even Ruby for a while, it was time to put the snake (a long shoe horn) away and wave bye-bye to Bampa as he backed out of the garage and went to work. Scaring everyone brought him great joy. Ate cereal with blueberries, fed dogs,doggy dishes washed, doggies taken out 3 times, watched Big Bird and Elmo for a little bit on Sesame Street. We have built a sand tower in the garage out of the sand that is used to keep the doggies from slipping on the ice, advised Bampa that his pond is frozen and needs more water. Made the Robin ‘flap flap’ around the house and go sit back on its perch to sleep. Read 3 books twice, done puzzles, played with the Little People Airport. All doggies have been kissed more than once and informed ‘WAKE UP’, found the kitties, started the dishwasher. Played dodge ball, seal, bounce the ball, chase around the island, spin the ball on your finger, kick ball and roll around on the ball on your tummy (which I didn’t participate in that one so much, hide and seek and it is not even 8:30 yet. Who knows what the rest of the day will bring.